It’s hard to write a classic. Most picture books are released, get a bit of fanfare — or not — and then are forgotten in the next year or two as more new books come out. So when a book has staying power, it’s an impressive thing. 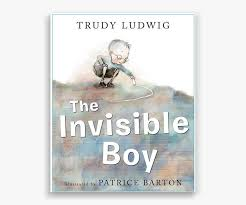 Such is the case with THE INVISIBLE BOY (Alfred A. Knopf, 2013) written by Trudy Ludwig and illustrated by Patrice Barton. And when you read it, if you haven’t already, it’s not hard to see why it’s still around and selling well five years later. To illustrate this, Patrice Barton starts the book drawing Brian in black and white and everyone else in full color. As the story progresses, it turns out that it only takes one other student to see Brian and include him for him to become full color too. It’s a great story to get kids and teachers thinking about who gets their attention — intentionally or not — and about how they can make sure everyone feels welcome and seen. There are great conversation starters included at the end of the book, too. It’s a book that’s going to hang around for many more years. “Owen McPhee doesn’t just like to talk, he loves to talk. He spends every waking minute chattering away at his teachers, his classmates, his parents, his dog, and even himself. But all that talking can get in the way of listening. And when Owen wakes up with a bad case of laryngitis, it gives him a much-needed opportunity to hear what others have to say. This book is so new, I haven’t even seen it yet. But I have a copy on order. It should arrive today. And, with its focus on yet another real-life problem for many people — kids and adults — this book sounds like another classic in the making. OH, AND BIG NEWS! Congratulations to Mary Mayhew who won a copy of Barb Rosenstock’s and Katherine Roy’s latest book OTIS & WILL DISCOVER THE DEEP. Fiction, Pat Zietlow Miller, Patrice Barton, picture book, Trudy Ludwig. Bookmark. 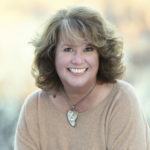 Russell Wrestles the Relatives + interview w/Cindy Chambers Johnson & giveaway! 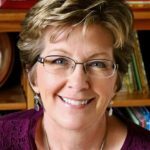 Thanks, Pat, for intruducing me to TWO must-reads!! This book is so important to so many children who are also invisible but even more important to the kids who aren’t, who can make a difference. Hope it keeps finding its way into the hands of children. Both of these books sound wonderful! As a teacher, I always felt bad for the well-behaved easy kids when I had to work hard to engage and redirect the busy, loud, and sometimes naughty difficult students. It’s a good reminder to focus on the invisible kids and let them know they are important too! Thanks for sharing these with us! I loved The Invisible Boy. Looking forward to this one too. I especially love Patrice Barton’s illustration style!! Looks like another good one. I’ll look for it. Thank you, Pat, for sharing these books. I look forward to reading both of them soon! Looking forward to this new one! Thanks for posting! Pat, this is, indeed, a timeless book, wth characters and situations that will always feel familiar, I’m sorry to say. I’ve read Quiet Please… and you’ll love it just as much. There’s a wonderful parallel with Brian needing to find his voice and Owen needing to lose his in order to take a more engaged place in their groups. Congratulations to Trudy Ludwig and Patrice Barton! THE INVISIBLE BOY is a touching and wonderfully illustrated book. 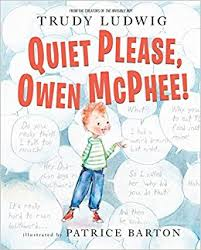 I look forward to reading QUIET PLEASE, OWEN MCPHEE. Unlike you, Pat, one of my kids was definitely an Owen! Thank you, Pat, for once again suggesting books that I really must read! I will put HOLD on both books at my library right away. Thank you, Pat, for introducing me to these books. . . . And I used to seat the louder, high-strung kid at the end of a row with an empty desk next to him/her. I have this one, and it chokes me up every time. Nice post, Pat. Thank you Pat. Both of these books sound wonderful and classic. This looks amazing. Thank you. I don’t often comment but wanted you to know how instructive all these posts are. Much appreciated. I love The Invisible Boy. Can’t wait to read their new book. Thanks for the head’s up, Pat! Have Quiet Please, Owen McPhee on my to-read list but not sure if I’ve read The Invisible Boy. Will have to track a copy down.